Finnish electro-tropical ensemble Maajo a new EP for Queen Nanny. Joined by Ismaila Sané from Senegal but currently based in Finland, Sané started his career as a dancer and percussionist in Dakar in 1974. He has since pursued an extensive international career and worked with the likes of Jimi Tenor and Piirpauke. 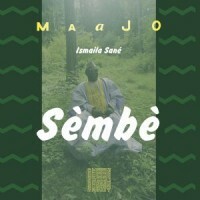 Ismaila and Maajo have produced two powerful songs in Jola language, spoken in Casamance, Southern Senegal. "Sèmbè "is an off-beat mix of disco reggae grooves, dancehall rhythms, trancey synths, and African gospel. The dub version on the flipside does what a dub is supposed to do, strips the track to its bones for bass-heavy sound system tweak. The second track, "Anaata", is a dark and mellow dub disco groover with an equally sublime vocal performance from Ismaila Sané.